Pheasant & Potato Kebabs with a side of ‘fruity’ chilli sauce – delightfull! Research suggests that pheasants are the most widely shot birds in the UK. Although the pheasant shooting season within England, Wales and Scotland is from the 1st October up to the 1st February, pheasant meat is, of course, available all year round! Whether you intend to use your own meat, buy from a specialist butcher or venture out to a supermarket, the ‘easy to cook’ kebabs, shown below, should be a hit at any barbecue! Incidentally, the pheasant meat suggested in the recipe that follows could be replaced with chicken if you prefer. Or, why not prepare both – and give a choice to your happy guests! When buying pheasant breast, it’s best to find a reputable butcher who will supply you with good quality meat. However, if you are considering buying your meat from a supermarket then make sure it is pale in colour and is lean and firm. So, when cooking outdoors what’s best to use? For example, should you use a charcoal or gas BBQ? Well, the type of BBQ you use will probably depend on how much time you have available and what your preferred overall taste is. A traditional charcoal BBQ is a bit more difficult to control – and it will take longer to reach the correct temperature – but it will provide you with a great smokey flavour, if that’s what you and your guests want to enjoy. 1. If you intend to use wooden skewers, it’s advisable to soak them in water for a while to prevent them from burning when in use. 3. Cut the shallots into four and then place them on to the skewers along with the meat and the button mushrooms, alternating as you go. Place the pheasant meat skewers on a different plate and set aside. 4. 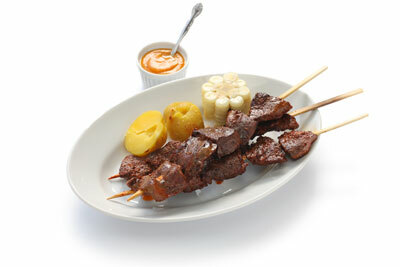 Cut the boiled potatoes into half and place them on a skewer. 4. Now prepare the marinade. In the mixing bowl add the olive oil, crushed garlic, chilli flakes, salt, pepper and sugar. Mix them together thoroughly. Then, separate the marinade into two bowls adding thyme to one mixture and dry rosemary to the other. 7. Place the kebabs on the BBQ and cook for 12 minutes, using tongs to turn them every 3-4 minutes. 8. When ready, remove the kebabs from the grill and place them on a serving plate. Add the Goch chilli sauce to the dipping bowl and ‘viola‘ that’s it! 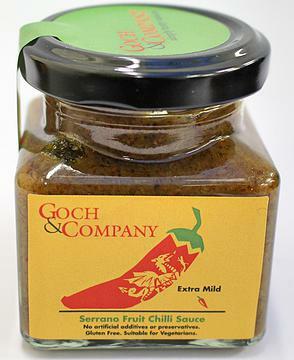 The fantastic chilli sauce will give that ‘extra kick’! So, pheasant and potato kebabs – with a side of ‘fruity’ chilli sauce – yum! WARNING: Always keep uncooked meat away from other foods until fully cooked and always wash your hands after handling uncooked meat before touching anything else!